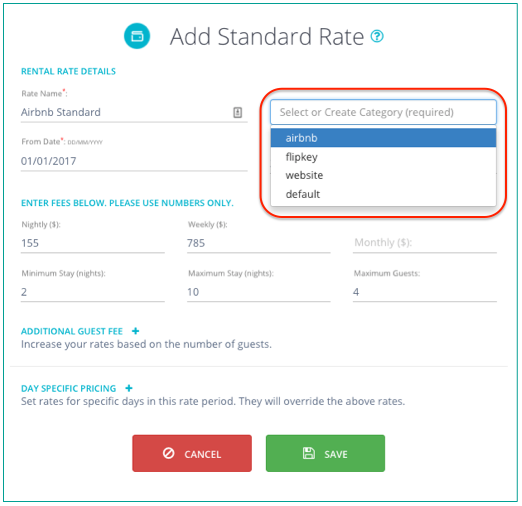 Rate categories are a powerful feature used to group multiple rates together. For example, you can use rate categories to label rates and push different pricepoints to different channels and your website. Unless you specify otherwise, a "default" rate category will apply to all rates when they are first created. To create a new rate category, simply type in the category field. If you would like to have different pricepoints for your different channels, create a second rate and change its name and rate category. Here is an example of two Standard Rates - one with category Airbnb and one with category Booking.com. This allows you to push different rates to different channels. Note: Rates within a single category are not allowed to have overlapping dates. When pushing rates to API Channels, you push a single rate category to that channel. All rates in that category will be pushed to the channel. 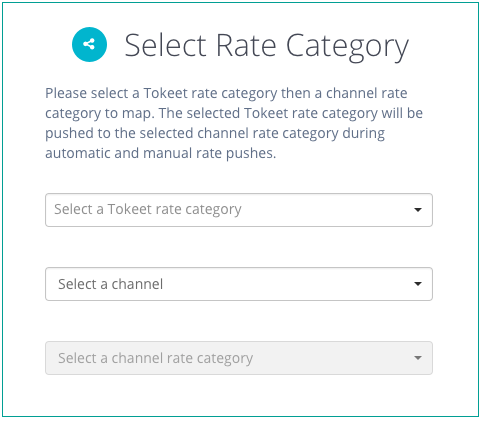 Rate mappings allow you to specify which Tokeet rate categories should be pushed to specific channel rate categories. This feature allows you to update all linked channels with one click, and is required for automatic Dynamic Rate updates. Click into a specific Rental and scroll down to “Rates & Payments” in the left side navigation. As an example, you may want to map your Booking.com rate category in Tokeet to the Standard channel rate category in Booking.com; repeat this process to map your Airbnb rate category in Tokeet to Airbnb. Auto Sync toggle applies to Dynamic Rates only. When enabled, Tokeet will automatically update your channel rates as your availability changes. Push All Rates allows you to push all your rates at once to your mapped channels. 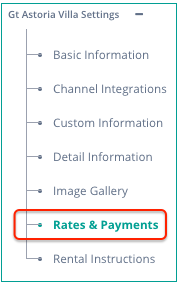 Once you have created your rate maps, you may then update all connected channels simply by clicking the Push All Rates button on the right.